(Minghui.org) I began to learn Falun Gong along with two other people on March 2, 2014. It was the heaviest snowstorm in the city’s history that day. People stopped going to work and instead went out to remove snow throughout the entire city. As the snow was cleaned up in the city, my mind also came to be purified by Dafa. I was a journalist at our local TV station for about 20 years before I practiced Falun Gong. When I graduated from college and first worked as a reporter, I was eager to be a good reporter. I felt reporting was a chance to serve people and reflect the true picture of society. However, a colleague wrote an article to criticize something, which nearly caused our boss to lose his job. Since then, our boss asked us to be political and work for the Chinese Communist Party (CCP) almost every day. He said that it did not matter how good our articles were; it was much more important, he said, that reporters remain obedient to the CCP. I worked as a reporter and gradually became used to the environment of deceit, flattery, and ignorance to the suffering of the lower classes. I thus became numb to work and life. Even my facial expressions became mechanical. I felt that I had no passion for my work or family members. Yet, my boss still praised me. He commented that I was more mature and good at my work. I won the title of “model worker” and received bonuses and other benefits. I had to report on each department and certain offices of city hall on TV at least twice a year, in order to show how much work government officials had done for the people, and to let them know that the communist regime was working very hard to serve them. For example, an agricultural department official said how much more rice the land had grown and how much more peasants had earned. Charity department officials said how many people suffered from disaster and how much the regime had done to help the people. The city hall leader said how much income for their residents had increased, how much tax the factories had paid, and so forth. As we became more familiar with each other, these officials later would tell us that the figures were fabricated for us to report on TV. Then we reporters told them that we would just report according to what they said. I got to know all the departments, including the court, the Procuratorate, the police station, and many other government departments. With no single exception, each was to carry out their supervisor’s requirements. In other words, the requirements of the Chinese Communist Party (CCP). If a writer wanted to express his own ideas, to discuss real questions for people, or to seek justice for everyday people, he was against the CCP, which meant trouble for him. Therefore, all the government officials learned not to care about the country, the nation, or society. How Many True Words Have I Spoken? My husband’s college classmate was arrested due to her practice of Falun Gong, and the local media reported her case. My husband also said he wanted to read the Falun Gong book. I was scared by the rumors fabricated by the CCP, so I stopped my husband from seeking it. I was curious about Falun Gong, however, because some people I knew were Falun Gong practitioners. I knew they were very good people, completely different from what the state media portrayed. The police department asked our TV station to cooperate by smearing Falun Gong in 2001. I’d had opportunities to meet Falun Gong practitioners since the CCP had launched the persecution of Falun Gong. I was brought to a detention center by a policeman and asked to record some scenes. After my work was done, I did not leave immediately, although the police had left. I was outside nearby a cell. A young man in his 20s quickly introduced the facts about Falun Gong to me. He said that the “Tiananmen self-immolation” was fake. He explained that the burning man’s hair had not burned, the gasoline bottle did not melt, and the fire blanket was already held behind him. Self-immolation takes but a brief moment to happen, yet Tiananmen Square is so big—how could the fire department have arrived so quickly? I was not moved by his words. Later, I learned that the young man had died due to the persecution after he did not denounce Falun Gong. I thought about how I had interviewed each level of department officials of the CCP and was deceived each time. But I still reported the figures given to fool Chinese people, which had happened for years and years. Lying was too easy, but reporting the truth was extremely hard. Any reporters who dared to speak the truth could be accused of being involved in political issues, lose bonuses, or offend relevant officials. One may even get fired or go to jail. I had become used to lying for my work. I used to edit footage to highlight only the facts that would slant the story the way my boss wanted. My colleagues and I wrote articles that won first prize rewards nationwide, but most of the content was fabricated. I was frightened by our government. I thought about how it fabricated lies in order to suppress kind people. I thought about my father and one of my relatives, both of whom were persecuted by the CCP. My father was an honest technical person. He had been targeted for persecution during the period of the Cultural Revolution, and he was branded as a “reactionary academic authority.” Two groups of guards fought to criticize my father and some of the guards were wounded in the battle. I was a target of discrimination in my class due to my father. No single classmate in junior high school dared to talk to me. The teacher would ask our entire class of students to mock Confucius by writing down some untrue sentences on the blackboard. My aunt’s grandfather worked very hard to save money to buy a small piece of land. The CCP categorized him as a landlord and did not stop attacking him. He was eventually persecuted to death. Through my own experiences, I knew that most of the people persecuted by the CCP were good people. I was debating what I should do. I was required to shoot some footage. The article about Falun Gong was written by the Public Security Bureau, so even my boss was not allowed to rewrite or change a bit of it. I submitted my work and lied again. I did not realize I was smearing Buddha. I felt guilty. Later, I transferred to a different job and finally stopped being a CCP reporter. I began to practice Falun Gong in 2004 because I suffered from all kinds of diseases. I could not cross both of my legs in the first month, but miracles soon happened. Multiple growths in the blood vessels of my legs disappeared. My severe nearsightedness was healed, and I no longer needed to use eyeglasses just a few months later. I was nearly 50 years old, but I grew taller after the practice began. My upper body improved and my hips rounded out. My female colleagues noticed the improvements of my body. I had changed into a good person. I cared for the elderly people in my family. I no longer wanted to change them. I treated my husband gently and stopped being bossy. I used Dafa’s principles—Truthfulness-Compassion-Forbearance—to guide my son and no longer yelled at him. Our home was harmonious. My work as a journalist for the CCP of 20 years had formed a bad habit: Lying had become second nature. After I practiced Falun Gong, I needed to get rid of this habit. Sometimes when I realized I was lying, I slapped my mouth. With longer and more diligent practice of Falun Gong, I was gradually able to control my speech and no longer lied. I still had challenges, though. I was not moved by her words. I was thinking about their situation and sympathized with them. My elder brother and his wife were laid off. They had a hard time making a living with their present jobs. They were under a lot of high pressure and worried about their family. I looked within and still found many of my own human notions. My attachment of seeking fame and profit was very heavy. I did not like hearing bad words from others, and my fame-seeking mind was strong. I really wanted to earn more money. I was shocked to find these attachments. My parents transferred ownership from one of their properties to my elder brother and his wife. I did not complain about it. I led a simple yet happy life. I would hop and skip while walking. My son asked me why was I so happy every day. I told him that I lived in line with Truthfulness-Compassion-Forbearance, which is the cosmos’ nature. I do what heaven tells me to do, I said, so how could I not be happy? My father dared not practice Falun Gong because he was persecuted by the CCP. Yet he said that Falun Gong’s Master was great, and he predicted that all of China would practice it in the future. He said that he would support my practice until that day came. His support of Falun Gong healed his high blood pressure and constipation. He became energized. He is nearly 90-years-old and he can still get around easily, even in winter. My mother liked to recite “Falun Dafa is good; Truthfulness-Compassion-Forbearance is good.” Her various illnesses were healed. She began to practice Falun Gong at the end of last year. Many miracles have happened to her since then. She used to wake up at midnight to eat so her stomach would not hurt. But now she sleeps until 4:00 a.m. when it is time to practice Falun Gong. She often saw Dafa books shining with golden light, and the words on the Dafa pamphlets were all golden. I have cultivated Falun Gong for 12 years. I feel that I am so lucky to hear about the upright way Falun Gong practitioners have responded during the harsh persecution. I have appreciated the practitioners who’ve risked their lives to spread Falun Gong all around the world, a spread which eventually found me. (Minghui.org) After being detained for over a year, Falun Gong practitioner Yue Guixia now faces trial, even though her case was turned down twice due to lack of evidence. Ms. Yue was arrested on September 18, 2015, as she distributed Falun Gong materials. She has been held in Pinggu Detention Center ever since. She was handcuffed, shackled and placed in solitary confinement. Ms. Yue suffered a nervous breakdown and was evaluated at a mental hospital. She was denied medical parole to seek treatment. Her husband, who suffers from severe diabetes, relied on his wife for his care. Their son had to quit his job to care for his father for a time until his health stabilized. Even though he managed to find another job, he is overwhelmed by the responsibility. Their relatives are very concerned and helped to hire an attorney for Ms. Yue. They are all looking forward to seeing her safe return. Ms. Yue, 50, was a housewife and lived in Beijing. She began practicing Falun Gong in 2004. Her health greatly improved afterwards. Her neck pain, back pain, severe insomnia, dry eye, and memory lapses all disappeared without medication. She abides by the principles of Falun Gong, Truthfulness-Compassion-Forbearance, is considerate of others, and no longer fights for petty gains. She took good care of her husband while he was sick, and her family became more harmonious as well. (Minghui.org) The best way to end injustice is to make it known. Two car tours kicked off in Queensland, Australia on September 22, with the mission of raising public awareness of the state-sanctioned organ harvesting from Falun Gong practitioners in China. One team took the southern route and visited Stanthorpe, and the other team visited three towns in northern Queensland, including Gympie, Hervey Bay, and Bundaberg. The car tours drew the attention of the local media and were warmly supported by the local residents at every stop. People were especially moved by the experience of one of the car tour participants, Anne Zhao, who was tortured in China for upholding her belief in Falun Gong. A reporter from the Gympie Times, a local newspaper, interviews Falun Gong practitioners. At the first stop on the northern route, the Gympie Times, a local newspaper, interviewed practitioners. Horrified by the Chinese communist regime’s forced organ harvesting of living Falun Gong practitioners, the reporter asked for detailed information. Anne told the reporter about how she was beaten with electric batons and tied to an iron frame in a Chinese prison, only because she refused to renounce Falun Gong. The reporter was surprised by how little he knew about Falun Gong and the persecution. He thanked the practitioners for staging the car tour and promised to share the information. WIN TV in Hervey Bay interviews practitioners. The reporter from WIN TV in Hervey Bay was also appalled by the organ harvesting atrocities. 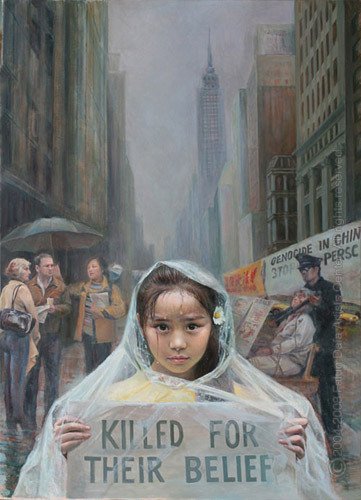 Practitioners showed the reporter recent evidence collected by independent investigators, who compiled statistics from 700 Chinese hospitals showing that thousands of Falun Gong practitioners in China have been killed for their organs since 2000. The reporter also asked Anne Zhao for details of her experience of persecution. Upon leaving, she said to the practitioners that she admires their spirit. She feels that they are doing a great thing by informing Australians about such a major event. The reporter asked practitioners to stay in touch and to keep her posted on developments in China. She said that she and her colleagues will try their best to pass on the information about what is happening in China. 4BU Radio in Bundaberg interviews practitioners. The city government of Bundaberg enthusiastically supported the car tour. They arranged a press conference at the busiest spot in town for practitioners, and informed the local media. 4BU Radio station received the press release and interviewed the practitioners. The reporter was saddened that so many innocent people have been killed over the past decade, and was especially concerned that so few people are aware of it. She promised to tell her radio audience about what has been taking place in China. Many local residents told practitioners that they heard about the car tour on the news the previous night, and they strongly support practitioners’ peaceful resistance against the bloody organ harvesting. The woman added that she admires practitioners’ spirit and effort. “Your persistence will stop the evil. Keep up the good work,” she encouraged practitioners. The car tour stops in Stanthorpe. Local newspaper Stanthorpe Border Post interviewed the practitioners. Many people signed the petition to condemn the persecution in China. (Minghui.org) Falun Gong practitioners gathered in Canada’s capital of Ottawa September 21-22 to call on visiting Chinese premier Li Keqiang to help stop the persecution of Falun Gong. They held large banners worded “Falun Dafa Is Good,” “Stop the Persecution of Falun Gong,” “Bring Jiang Zemin to Justice,” and others during the course of his visit. Falun Gong (also known as Falun Dafa) was made public in 1992 in China and became very popular in the following years due to its marvelous health and spiritual benefits. Practitioners follow the principles of Truthfulness-Compassion-Forbearance in daily life. Jiang Zemin, then head of the Chinese Communist Party (CCP), initiated the brutal persecution utilizing the entire state apparatus in 1999, out of jealousy for the popularity of Falun Gong, and paranoia of losing control. The ongoing persecution has led to deaths of many practitioners, including those killed under the CCP’s state-sanctioned organ harvesting from living practitioners in China. Practitioners took the opportunity to raise awareness of the persecution during the premier’s visit. They stood in front of the Westin Ottawa Hotel where Chinese Premier Li Keqiang stayed, on Parliament Hill where he met with Canadian Prime Minister Justin Trudeau, and outside the Canadian Museum of History where Li had dinner with Prime Minister Trudeau. Falun Gong practitioners hold banners in front of the Westin Ottawa Hotel. Li’s motorcade meets with Falun Gong practitioners on way to Parliament Hill. Falun Gong practitioners hold banners in front of Parliament Hill. Tourists pass by protest on Parliament Hill. Falun Gong practitioners hold banners in the rain in front of the Canadian Museum of History, waiting for Li’s motorcade from dinner with Prime Minister Trudeau. A member of parliament (MP) commended the Falun Gong event and supported efforts to oppose the persecution. Many tourists accepted Falun Gong informational materials and spoke out against the persecution after learning the facts. The Chinese embassy had arranged an official “welcome group” consisting of paid Chinese Canadians, merchants, and students. They stood with a dividing lane between them and the Falun Gong group. Both sides expressed their greetings to the Chinese Premier in their own way. Some Chinese in the welcome group agreed to withdraw from the Party and its affiliated organizations after practitioners helped them see the true nature of the Party. Canadian MP: I Support You! MP Karen McGrimmon (left) poses for a photo with a Falun Gong practitioner. MP McGrimmon said that she had a meeting to attend and would talk about Falun Gong during a later appointment. Researcher Photographer: I Support You. Research photographer Paul Lauzon said, “I support your efforts against the persecution and lawsuits against Jiang.” He indicated that the Canadian government should exert more pressure on the Chinese government because the Chinese regime does not want to stop the persecution, especially the live organ harvesting for profit. The Chinese regime is afraid of people gathering and presenting a challenge. He observed that there is no freedom in China and suggested that this is one reason why so Chinese people immigrate to Canada. A Hungarian couple saw Falun Gong practitioners in front of Parliament Hill and learned about the persecution in China. They then went to the welcome group and listened to their explanation. They came back to the practitioners before departing. The wife Anna Maria said, “I never heard of Falun Gong. Today I see so many practitioners demonstrating the exercises and holding banners. I want to learn about the practice. The persecution in China, especially the live organ harvesting, is horrible. Omar (left), Vincent (middle), and Alexander (right), students from Quebec, in front of Canadian Museum of History. Omar Livoie is a student at a university prep school in Quebec. He and his two classmates went to visit the Canadian Museum that day and saw the practitioners with large banners. While listening to a practitioner explain the issues, he translated to French for his classmates. Omar and his classmates said that Falun Gong practitioners should have freedom to practice anywhere in the world. The three students supported the practitioners’ effort against the persecution. They shouted together, “Stop the persecution!” twice. The Chinese lady said she was a Christian and had read the Nine Commentaries on the Communist Party and Falun Gong information materials. She agreed to withdraw her membership in the Communist Youth League and Young Pioneers. She then left the welcome group. A practitioner talks with a Chinese tourist. Practitioner raises awareness of the persecution to tourists. A practitioner raises awareness of the persecution to Chinese tourists. On the way home, a practitioner met with a few Chinese people, one of whom said with a smile, “I saw you in the dinner with the Chinese Premier.” The practitioner said that he did not attend the dinner and that the man must have taken him as a guest who attended the dinner. He then talked with several Chinese guests who attended the dinner about the nature of the CCP and the persecution of Falun Gong. One guest agreed to withdraw from the CCP and said he would advise the others to withdraw their affiliations as well. (Minghui.org) After encountering Falun Gong (also known as Falun Dafa) rallies in New York City earlier this week, Chinese Premier Li Keqiang once again saw peaceful protests by the group while visiting Ottawa, Canada for the latter part of the week. Falun Gong banners in front of the Westin Hotel, where Premier Li has been staying while in Ottawa. A passerby shows support for Falun Gong. Falun Gong banner in front of Rideau Hall. After visiting the parliament, the Premier Li saw the Falun Gong group’s peaceful demonstration again on Wellington Ave.
Canadian Members of Parliament Peter Kent and Jason Kenney spoke at the Falun Gong rally in front of Parliament Hill on Thursday. They called on Li Keqiang to help bring the former communist head Jiang Zemin to justice for his crimes in the persecution of Falun Gong. MP Jason Kenney at the rally shaking hands with practitioners. Jason Kenney, who has served in the House of Commons for 19 years, shouted in Chinese “Falun Dafa is good!” at the rally on Thursday. He called upon the Chinese premier to respect the human rights of Chinese people. MP Kenney thanked Falun Gong practitioners for passing on the important message that reminds Canadians not to take human rights and freedom for granted. MP Peter Kent gives a speech at the rally in front of Parliament Hill. Peter Kent, the chair of Parliamentary Friends of Falun Gong, spoke about the lawsuits against Jiang Zemin, who, as the then head of the Chinese Communist Party, launched the persecution of Falun Gong in 1999 and personally directed it. MP Kent said that Jiang’s crimes have been recorded in detail and more than 200,000 Falun Gong practitioners have filed lawsuits against him since May 2015. He urged the Chinese government to indict Jiang and stop the persecution of Falun Gong. One month ago, Canada’s Prime Minister Justin Trudeau received 120,000 signatures before his G20 Summit trip to China, which urged him to bring up the Falun Gong issue while meeting with Chinese leaders. Many local residents and tourists from all over the world saw the Falun Gong demonstration in front of Parliament Hill on Thursday. Brustolin Juliano from Brazil stopped at the rally to show his support. He said he has seen Falun Gong activities in his home country. He signed the petition at the rally to condemn the brutal persecution. A visitor from Scotland, Joyce Symon, said she had never heard of the state-sanctioned organ harvesting from imprisoned Falun Gong practitioners in China. Outraged, she said it is very important for people to know what is going on, and she signed the petition, too. Canadian government official Anne Clark said she has seen peaceful protests by the Falun Gong group many times. She believes that the Canadian Prime Minister has the responsibility to bring up human rights issues to any country, including China, because protecting human rights is one of Canada’s basic values. (Minghui.org) During the Australian Falun Dafa car tour, practitioners from Sydney have provided information about the ongoing persecution of Falun Dafa in China, especially the state-sanctioned large-scale forced organ harvesting from living Falun Dafa practitioners in China, to almost 60 towns in Australia. More than 200 towns are on the car tour route. Practitioners have received great support in every town they passed. It happened to be Parliament sitting when the car tour arrived in Canberra on August 30, 2016. When Falun Gong practitioners held a rally in front of the Parliament House, Senator Janet Rice and Senator Scott Ludlam attended the rally to show their support. They praised Falun Gong practitioners for their work and expressed their support for human rights in China. Falun Gong practitioners submitted more than 3,000 postcards with signatures from the public, calling for the Prime Minister to urge the Chinese government to stop the persecution. Senators are passing the postcards to the Prime Minister. Falun Gong practitioners hold a rally in Melbourne. Senator Janet Rice and Senator Scott Ludlam show their support at the Falun Gong rally in Canberra on August 30. Senator Lee Rhiannon from New South Wales sent a supportive letter to the rally. She wrote that U.S House Resolution 343 had brought hope. She would like to see the Australian government formally condemn and help stop the organ harvesting in China. MP David Shoebridge in the NSW Parliament called for Prime Minister Turnbull to raise the human rights issue directly with the Chinese regime. He said there was nothing to lose, and we had the responsibility to help stop this practice (organ harvesting) as part of international society. Victorian State MPs Bernie Finn and Gerard Flood, treasurer of the Democratic Labor Party, praised Falun Gong practitioners’ work at the rally in Melbourne on September 2. Mr. Flood encouraged practitioners to visit members of parliament to tell them facts about the persecution. News.com.au, a news website owned by News Corp Australia, interviewed several Falun Gong practitioners from the car tour, and produced a series of reports, including Extreme torture: Inside China’s correctional facilities, Inside China’s secret brainwashing centers: “People only see what the government wants them to see,” and The Reality of Human Organ Harvesting in China. These reports exposed the tortures, brainwashing, and organ harvesting from living Falun Gong practitioners in China. The reports were coupled with interview videos. A WinTV reporter interviews Falun Gong practitioners. A practitioner is interviewed by ABC Radio Australia. Reporters from BorderMail, Newsweekly, DailyAdvertiser, and other media reported on the car tour. Besides mainstream media, local newspapers, TV stations, and radio stations also reported the car tour as it passed through their cities. Falun Gong practitioners in the tour visited many local governments and offices, hospitals, libraries, and churches. Many people offered to help with spreading the news. They helped practitioners contact governments and media, and post information along the streets. Falun Gong practitioners demonstrate exercises in front of Taree City Hall. Father Ken supports Falun Gong practitioners. Many people sign postcards calling for the Australian Prime Minister to take action to stop organ harvesting. Sisler, a teacher in Goulburn, asked for more than 20 postcards for colleagues and friends to sign. Allen in Dungog shows great interest in Falun Gong and would like to help stop the persecution.